SBG Systems designs, manufactures and market a complete line of inertial sensors based on the state-of-the-art MEMS technology such as Attitude and Heading Reference System (AHRS), Inertial Measurement Unit (IMU), Inertial Navigation Systems with embedded GPS (INS/GPS), etc. SBG Systems take the most of the MEMS technology by combining strict sensor selection with advanced calibration techniques and embedded powerful algorithms to offer miniature and low-cost solutions while maintaining a very high performance at every level. 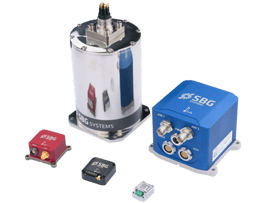 SBG Systems offers advanced inertial navigation systems for driverless cars as well as unmanned systems whether they are land, aerial, or marine. From hydrography to mobile mapping and aerial cartography, SBG Systems offers a complete solution including the IMU, PPK software and services. Our inertial sensors provide excellent motion sensing and heave monitoring useful in various markets such as car testing, buoy, gimbaled camera, etc. SBG Systems Headquarters are based in Carrières-sur-Seine, a few kilometers away from Paris, France. The company operates full services from research and development to after sales support for EMEA, Asian and South American markets. SBG Systems France is also the worldwide production facility. SBG Systems North America, Inc.
SBG Systems is a world leading manufacturer of innovative MEMS-based motion sensing solutions and is constantly looking for talented profiles for its Headquarters in France, and its subsidiary in Califonia. We have been putting our passion and expertise in developing innovative inertial sensors for more than 10 years, addressing the most inspiring markets (robotics, cartography, driverless cars, etc). Featured in 2017 in the French Tech Fastest-growing companies, as well as in 2014 and 2015 in the Deloitte Technology Fast 50 et Fast 500 EMEA, the company is growing fast.